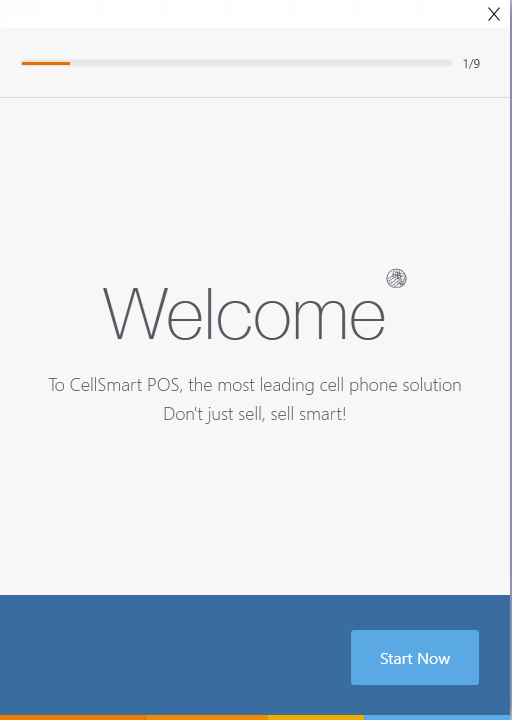 The Welcome screen is the initial screen which appears when starting CellSmart POS for the first time. It consists of nine small steps which allow you to set up your software and get started. It asks you for the information that is required in order for the setup to be completed which includes the sign-in ID and password and the log-in username and password. Click on the CellSmart POS desktop icon to start the software. From the welcome screen, click on the Start now button to proceed to the next step. Enter the Email and Password that you created during your sign up with CellSmart POS, and check the Terms and conditions box if you agree with Cellsmart's terms and conditions. Once you enter your credentials, you may click on the Login button. The software will present you with a list of the stores you signed up with, select a store/location so that when you start up the software the data will automatically be linked to it, and then click next. Click Finish to proceed with the setup. Once you click on Login, your software will start up and you'll be ready to sell Smart!